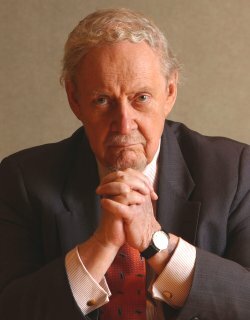 Former Supreme Court nominee Robert Bork has sued the Yale Club for an amount “in excess of $1,000,000,” plus punitive damages, as a result of a trip and fall accident on June 6, 2006. The Complaint is here via the WSJ. The accident happened while he was climbing to the dais for a speech, and there were no steps or handrail for the 79-year old Bork to hold on to. The main injury he claims to have suffered were a hematoma in the leg that required surgery and months of rehabilitation. The New York Times notes that he proceeded to deliver the speech after he had fallen. This is a routine New York personal injury case. There is nothing particularly exceptional about it from the Complaint other than the plaintiff, a noted conservative jurist who has been part of the American Enterprise Institute, which engages in tort “reform” activities. The Complaint doesn’t even come close to explaining why punitive damages would be warranted in such a routine negligence matter. My gut reaction is that it is frivolous. The Complaint asked for attorneys fees. Why? You can’t get them in New York for a standard personal injury claim. The Complaint asks for pre-judgment interest. Why? You can’t get that here either. Sad, but true. Interest runs from the date of the judgment not from the date of the accident, thereby giving insurance companies a reason to delay litigation as long as possible. Perhaps Judge Bork wants to come with me the next time I lobby the legislature to amend the law to include pre-judgment interest? The Complaint asks for an amount “in excess of $1,000,000” (not merely $1M, but in excess of). Where are the damages for making such a huge demand? In a 1995 opinion piece published in the Washington Times, Bork and Theodore Olson, who later became a top Justice Department official, criticized what they called the “expensive, capricious and unpredictable” civil justice system in the U.S.
“Today’s merchant enters the marketplace with trepidation — anticipating from the civil justice system the treatment that his ancestors experienced with the Barbary pirates,” they wrote. I suspect that the folks at TortDeform will now add Bork to their roster of “Do as I say, not as I do” hypocrites of tort reform that suddenly changed their minds when it was no longer someone else’s injuries at stake. Finally, the Complaint is signed by Bork’s counsel Randy Mastro, of Gibson Dunn & Crutcher. Mastro’s bio asserts that he “is a litigation partner who handles both civil and white collar criminal cases.” Also listed is Brian Lutz, who does “securities litigation, corporate control contests, antitrust matters (both civil and criminal), insurance/reinsurance coverage disputes, and white collar defense.” This is a white shoe firm with a dozen offices around the world. They apparently have lots of BigLaw experience. There is no personal injury law experience noted for either. The complaint is filled with specifics about the incident (usually not done locally, it is usually very general), also meaning it is not boilerplate. They make multiple, unrelated , allegations in a single paragraph, making it impossible to admit or deny any of the facts in the answer (thereby destroying any benefit to putting in specifics) . And while not fatal, it is against the rules. It is certainly not boilerplate to allege punitive damages in a trip and fall case unless there is something particularly outrageous. And it isn’t a separate cause of action for punitives as they have alleged. And it is certainly not boilerplate to ask for things such as pre-judgment interest and attorneys’ fees in such an action, when they are clearly not allowed. The reality is that there are thousands of solo and small firm practitioners who know this stuff cold, and Bork picked counsel with a lack of experience. That’s what I glean from the Complaint, and is the most likely reason frivolous claims appear. Addendum 6/11/07 – I have a new post on the subject: What Should Bork Do Now? Addendum 6/13/07 – I searched TownHall, a site with dozens of conservative commentators, to add additional viewpoints to this collection, but could find no reference whatsoever to the lawsuit.